All work and no play makes Jack a dull boy. Well I may not be dull, but I was a little sad not being able to get a little birding in this long Memorial Day weekend. The yard and garden has taken over so much of my spare time recently I’m trying to finish up as much as I can so I could get away for a morning. So with Kathy going into work yesterday, the time was ripe for some local birding. Which isn’t a bad thing since both of the above mentioned birding hotspots are some of my favorites. The morning was warm and humid as I steps out of the bird-mobile at Ellis Lake/ West Chester Wetlands. So much of the water that was previously there was mostly dried up. 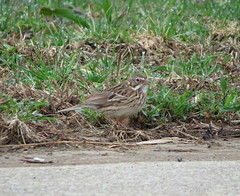 However there have been reports recently of White-rumped Sandppipers here so here we go. The large field which will normally hold a boat load of water after a good rain was just a couple of small mud puddles. Scanning paid off with mostly Killdeer and some Spotted Sandpipers. The low spot in the field is this ditch which will hide even the smallest bird was still a hundred yards out of sight, so I walked out into the field in the attempt to close the gap a little and get a better view into the ditch. Not surprisingly was my White-rumped Sandpipers. So much of the water drains into this ditch, which in turn attracts the birds. However my stay was shortened with the onslaught of some flying, biting insects that were feasting on my flesh. Willow Flycatcher at Ellis Lake. Onto Gilmore Ponds. I spent over 3 hours here and as the Sun rose higher and higher birding became more difficult as energy levels drained for the heat and humidity. From the Gilmore Road parking lot the trail dives right into a flooded forest. Home to Wood Ducks and Prothonotary Warblers I always thought how much fun it would be to drift in a canoe in this tall stand of trees, but I don’t think the Butler County Metroparks would like it much. There were a few folks either enjoying the park with a nice walk, or a few who were there to photograph whatever fancies their interest. I was the only birder. Green Herons are one of my favorite bird subjects. The hold still long enough for you to get a decent picture, and this one was very cooperative. The portion of trail I was walking on runs along side of the old Miami-Erie Canal. Vegetation is so thick along the edges that your not able to see over it. The Butler County Regional Airport is on the other side of the canal, and some railroad track, and if it wasn’t for the airplanes you’d never know it’s there. I was able to find a spot where there was a log lying over the now silted over canal, so I tight roped over and peered over the tracks. This part of the airport property slopes down towards the canal and held massive amounts of water where Great Egrets and Great Blue Herons made their home. Now in this picture you see my spotting scope in the middle, next to the Hemlock. My scope stands a few inches over 4 feet. So you get the idea of how tall, and closed in you can feel along this trail. As the morning wore on, birds were becoming fewer and fewer. I had reached the half way point when the desire of the ice water in the truck started to call. I made sure that I hydrated myself before leaving, but i was starting to get a little parched. So I quickened my pace. The stops were less frequent as I made my way around the park. I’d stop and check out when the birds got a little more active than usual. But the last half of the trip was pretty uneventful. The trees became sparse and open fields spread out before me. as well as Eastern Kingbirds. A much needed trip. There are times when we need to get back to nature to recharge our souls. As a young adult one of my fondest memories of Saturday television was the 30 minutes I’d spend with Jim Crockett and the Victory Garden. I would absorb as much as I could in hopes of someday having my own vegetablew garden. I even went out and bought the companion guide so I could follow along. This was my bible as years later we finally had the house with enough property to have my own Victory Garden. My results over the years have ranged from awful to spectacular, and everywhere inbetween. I normally don’t mix birdig with gardening unless it’s something very obvious, like yesterday. Binoculars aren’t something I keep in my gardening bag. Dirt and fine optics don’t mix. But having a keen sense of hearing is always a plus when you hear a Yellow-throated Vireo skulking around in the thick vegetation that seperates my yard from my neighbors. The Yellow-throated Vireo is a new yard bird for me, and a real treat yesterday morning as Kathy and myself busied ourselves with our Spring plantings. For the longest time this was almost at the top of my nemisis bird list, and now that I’ve become familiar with it’s call it’s been easy to pick it out of all the other bird calls that fill the air on a warm Spring morning. Description: Length 6-8″ (15-20 cm) ADULT MALE Has mainly sandy brown upperparts and white underparts, with a continuous black breast band and collar. Note the distinctive black patch through the eye and on the forecrown, defining the white patch in front of eye and very narrow and short white supercilium. Legs are orange-yellow and bill is orange with a dark tip. In winter, black elements of plumage on head are mainly brown, especially on forecrown; bill is mainly dark, but with dull orange at base of lower mandible. 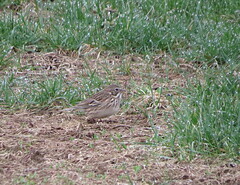 ADULT FEMALE Similar to male, but black elements of plumage on head are brown. JUVENILE Similar to winter adult, but breast band is small and often incomplete. Voice: Utters a soft tchu-eep call. 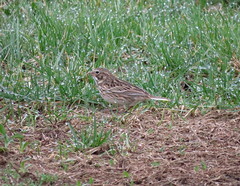 Habitat: Common and widespread in breeding season, nesting beside lakes and rivers across Arctic North America and present there mainly May-Aug. Fall migrants can appear in any suitable open, damp habitats, but are obvious on Atlantic coast. Occurrence in winter is extremely wide-ranging: found on coastal shores and estuaries from Atlantic and Gulf coasts to southern South America. FYI’s: Runs at speed (as if powered by clockwork) and then stands still for a few seconds before picking a food item from ground. If you happen to be in the area of Bass Island take the opportunity to check out some of the nesting Cliff Swallows (Petrochelidon pyrrhonota). They appear to be nesting underneath the portion of bridge that the bike path. One thing to remember about nesting birds, keep your distance especially if you’re planning on taking pictures. And if you have a few extra minutes take that short drive to the farmers market on Roundbottom Road and check for wading birds. With the un-offical start of Summer knocking at our door this Memorial Day Weekend birding is definitely on my mind, however my vegetable garden is in need of some serious attention. Some of the plants that I transplanted suffered and needs replacement. And with anyone who tries to maintain any flowers in your landscape will know that weeds can always be pulled. But all’s not lost. Kathy is planning on going into work on Monday so that’ll be my birding day. Destination has yet to be determined.